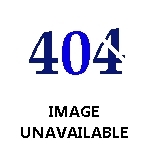 Discussion in 'Hommes' started by lucy92, Oct 6, 2008. 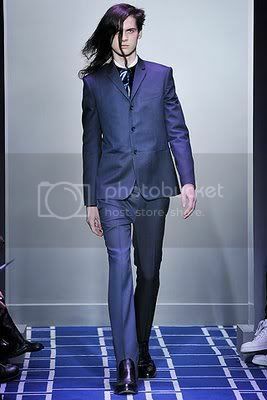 THE colour of the suit may be blue steel, but there's nothing Zoolander about Jethro Lazenby. The androgynous-looking son of Aussie rock god Nick Cave made his international catwalk debut at Paris Fashion Week and followed it through with rave reviews. Hitting the runway for stellar fashion label Balenciaga, the 18-year-old strutted past rumours that his father's name was the reason for his bolstered modelling career by working the show like a pro. His pale skin, waif-like figure and bizarre haircut saw him fit in well among this year's fellow fashionistas and the "alien-chic" look. His mother agency in Oz said they don't need to cross their fingers to get him future work. "We're fielding calls from Milan and New York and trying to arrange jobs for him," a spokeswoman said. I was slightly curious about him, just because he's Nick's son Not really feeling his look in polaroids and candids though..
safe to say he won't be a model who's asked to change his name for one more original..
does anyone know in which issue of i-D he is in? He looks so much like his father it's insane. I don't like how unkempt he looks in the jak&jil or in the candids but he looks really interesting and androgynous when photographed by Hedi Slimane, although Hedi could make anyone look good. He seems really hit or miss from what I've seen. I still cant believe he is Nick Caves son! He worked at a couple of fashion weeks in Melbourne and I knew his face from somewhere and totally couldnt work it out how... really lovely boy. seems to be doing well as well. can he be more adorable?! he's definitely got his father's expressions....and sense of self-expression. btw,does that now make those of us who lust nick a bit weird? i used to lust after nick cave...but his looks have gone a bit downhill lately. (i dont dig his handlebar mustache)...this son will make a great substitute! and masquerade, i think you are right...i think nick is only slight compared to the other bad seeds. I just came across a quote from him about not wanting to follow his father's shadow initially, but if he can make money from it, why not? I don't know, it is just such blatant nepotism...I mean, look at the kid. 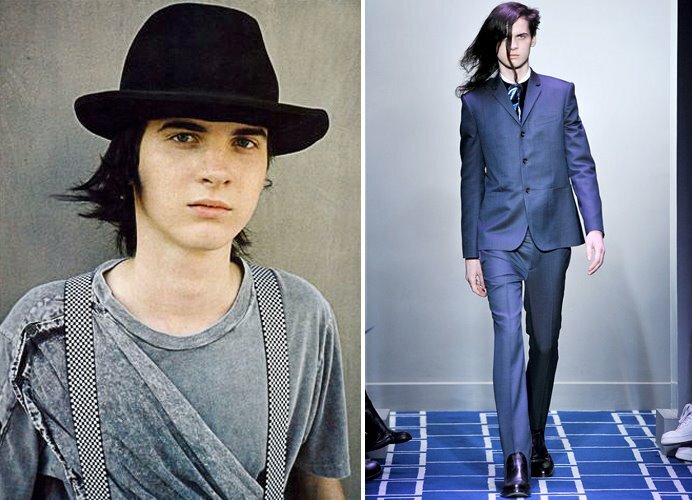 Would he be modeling if his father wasn't Nick Cave and his step-mother wasn't Susie Bick With regard for his looks I definitely see hints of his father but this kid is extremely androgynous (Nick, no matter how thin and wiry, always seemed the ultimate representation of raw masculinity to me). i doubt that his father's connections have helped too much. nick cave has a bad habit of dumping his former families for better pastures..susie bick might not last long either. although, i would not doubt that hedi slimane and nicholas G of balenciaga are probably humongous fans of nick cave.